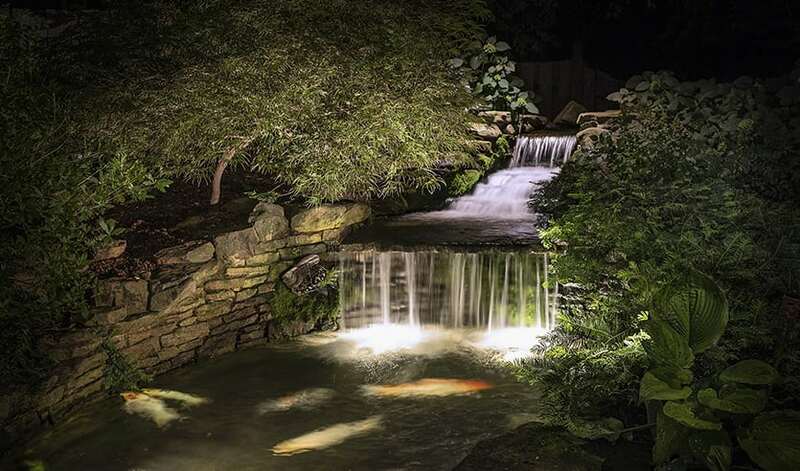 The process of using concealed luminaires in the landscape to reveal the living works of art all around us at night, has been around since 1933 when the pioneer inventor of landscape lighting, Frank B. Nightingale, began this segment of the lighting design industry. Frank was an artist who believed that light fixtures and light bulbs were nothing more than simply the “artists tools” by which he could “paint in” select fine details on trees, architecture and art-forms within the outdoor garden spaces, literally painting in these beautiful details with every stroke of light and pulling them back from the black canvas of night. For nearly 75 years the principles of proper outdoor lighting design were passed along from one generation to next, to those that valued and contributed to the advancement and preservation of this art. However, the invention of the light emitting diode (LED) and the flood of inexpensive, do-it-yourself light fixtures over the Internet, has drastically changed all of this in recent years. Since 2008, when I drive around neighborhoods at night I see more and more landscape and architectural lighting installed. It is being put out there with very little thought to comprehensive lighting design or the end user’s needs. If the company you are interviewing to hire also “specializes” in landscaping or irrigation for their business, or even so-called outdoor lighting companies that meet you at the door with a handful of light fixtures and leading with” see how beautiful and well-built our light fixtures are” you can rest assured knowing you will be hiring a lighting installer and not a lighting designer. Operators like this will leave most homeowners with a feeling of regret and underwhelmed by the result of the applied lighting. Anyone can install a light fixture for you, but very few possess the vision, training and skill to design with light. It’s not the paint brushes or the paint (fixtures and bulbs) that create the work of art. It’s the vision and skill of the artist knowing who skillfully wields those tools to create a visual masterpiece that is on full display, night after night. Last summer, while visiting Panama City Florida with my family, we were driving around the Arts District, taking in the sights when my oldest daughter spotted a small art studio. “Dad, can we go inside?” my daughter asked excitedly. Walking into the studio, I was met with an expansive space with all four walls completely covered in paintings of various sizes and styles. In the middle of the room were 20 to 30 small micro studios where local artists from the area would come to put their visions on canvas. The paintings around the room ranged from very simplistic to museum quality art. As I walked around the studio I noticed that all the artists had virtually the same tools in their studios; paintbrushes, tubes of paint, easels and other art paraphernalia. It was there that I came to this realization and gained inspiration for this article. You see, real art is not about the bristle count of the paint brush or the saturation of the pigment in the paint that makes a painting beautiful or captivating, but rather it is all about the vision and expertise of the artist, to expertly use those same tools to produce a composition and scene out of thin air that is remarkable. Lighthouse Outdoor Lighting upholds and adheres to the long-held design principles of outdoor lighting. 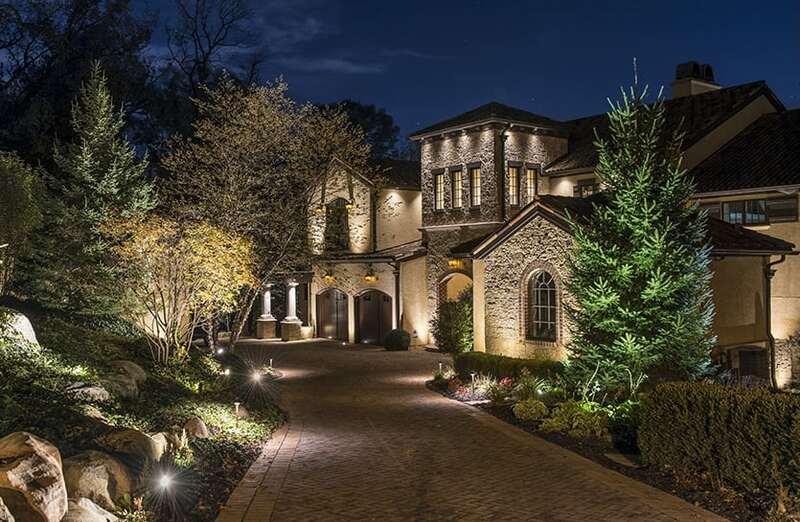 As new products and innovations present themselves, Lighthouse’s vision is to continually advance and reinvent the art of outdoor lighting, while raising the next generation of premiere lighting designers to WOW our clients from coast to coast. Lighthouse Outdoor Lighting is an active member of the AOLP (Association of Outdoor Lighting Professionals).